If you’ve lived in your home for awhile, you probably know that it can sometimes be a labor of love. The things that were top-of-the-line when you moved in have seen better days. The walls could use a fresh coat of paint. Perhaps the roof needs replaced. Whatever the case may be, as the old saying goes, nothing gold can stay. In other words, things change over time. As a homeowner, you know that better than most! The good news is that if it’s time for a change of pace with your home, the team of experts at UpWright Restoration Services can help! We’re primarily known as being the go-to roofing contractor in Minneapolis and the surrounding area, but we can help out with other projects too. That’s why in today’s post, we’d like to share a few tips for taking an old home and giving it the update it needs–and how we can help you do that! Keep reading to learn more. If you’re looking for a quick way to boost your curb appeal and make your home the envy of every neighbor on your block, consider the ways that you can make some changes to your yard. A few well-placed shrubs, a planter box for flowers, and some new trees can really make all the difference. Do you have a front porch? Hanging a few flowers provides an inviting look. To make a total transformation, consider purchasing new patio furniture, getting new numbers for your house, or painting the trim around the porch. As we mentioned above, what was once considered the best of the best might be looking a little dated. This can be especially true when it comes to the fixtures throughout your home. Yes, we’re being overly general here, but the truth is that many homes are in need of a good update. Making changes to the sinks and faucets in your bathroom and kitchen can have a big impact, to be sure, but you’ll notice a drastic change if you upgrade your brass light fixtures to something that’s a little more modern. The best part is that it doesn’t cost an arm and a leg to change out the light fixtures thanks to many budget-friendly options that look like a million bucks. Is it time to ditch your outdated carpet? The great news is that you have more options now than ever before. Prefer the look and feel of carpet? There are a number of great suppliers to choose from. Want the look of hardwood without the price? Laminate flooring offers an inexpensive and easy-to-install option for DIYers who don’t mind doing the work. Oak floors will never go out of style and having hardwood flooring installed can make a big difference. 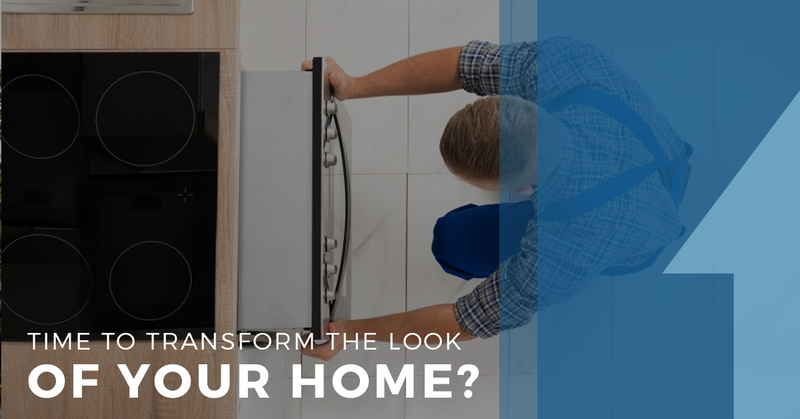 Whichever route you decide to take, you’ll have plenty of choices available to you to ensure that you get the right look and feel for your home. If it’s been awhile since you’ve painted around your home, it might be time to put up a fresh coat. This is the perfect opportunity to get rid of the fiesta-orange walls that the previous owners thought would be a great idea. You’ve never loved them anyway, so why not make the change now? Painting the walls of your home is a project that can often be accomplished in a weekend or two if you time it out right. If it’s time for a change on the outside of your home, it may be in your best interest to consider installing new siding rather than painting. The good news is that at UpWright Restoration Services, we’re your go-to siding contractors and we’d be glad to help you make a big change. Last, but not least, if you’ve been in your home for awhile, it might be time to start thinking about a new roof. On average, roofs can last from anywhere between fifteen and twenty years, and our team is proud to offer both roof repair and roof installation services to suit your specific needs. Having a good roof over your head is crucial, so if you want to protect the hard work that you’ve done to make your house a home, we’d love nothing more than to be your go-to roofing contractor in Minneapolis and the surrounding area. We pride ourselves on building with care, craft, and conscience, so whether you need a roofing company, someone to do siding installation, or even a team who can install new gutters around your home, you’ll find it at UpWright Restoration Services. We offer a number of different services to homeowners who are looking to do a bit of restoration, so if you have a project in mind, we’d absolutely love to help. Take a look at what others are saying about us and you’ll see that we run our business with integrity. We pride ourselves on never pushing work that is not truly needed, so if you’re ready to make a change in your home and you want to work with a team that’s known for doing business honorably, look no further. With over two decades of experience, we’d be glad to work on your home. Contact us today to get a roof estimate or ask about any of the other services we offer. We look forward to hearing from you!